As Canada’s leading national wholesaler and manufacturer of LED solutions, LED Canada is pleased to announce its new members plus online purchasing portal; making buying LED products even more convenient. In Canada there are many companies offering LED products, yet trying to buy priced right, quality LED products without going south of the boarder can prove frustrating. Few companies have local stock and few companies know the technical features of the products. Retail big box stores with national distribution are starting to offer more LED options, but the quality of the current retail offerings is often substandard and not warrantied for commercial use. Many large commercial distributors may have products in their showrooms, but as soon as you try to order them, you find out there is weeks of delay while they “special order” the inventory in from overseas suppliers, frequently with special order prices. Conversely, specialized companies may stock popular items, but often those units are available only in one location and the hidden costs of delivery or warranty support can be significant. 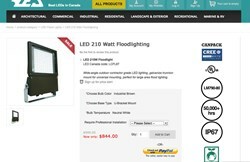 With the new members plus portal, large corporate purchasing managers can go through a simple online signup to have 24x7 online access to their own online warehouse of LED products, with customized pricing and products available to ship as soon as next day from multiple warehouse locations across Canada. For the more complex of orders our highly knowledgeable staff can give you a world of advice with more custom quotations. For channel partners the portal is even more convenient. Channel partners can provide their end user customers with online access under their own profiles and receive commissions from their customers’ orders, creating a new sales channel and a much more scalable revenue opportunity then the traditional supply chain model. The portal provides pricing based on volume and channel partner status, maximizing the ROI for customers, and automatically calculates shipping costs. The shipping function allows larger customers to supply branch offices directly, without the need for centralized warehouses of their own or extra distribution costs common with alternative supply models. Channel partners can drop ship to their end users directly, with customized shipping labels that eliminate the need for their own warehousing costs. With sales and technical support available in two time zones the online functions are supported by real Canadian professionals working hard for Canadian businesses. Just another innovation from LED Canada, making Canada a brighter place for LED solutions.